There is a misprint on the copyright page of Open Source Development With CVS, 3rd Edition. 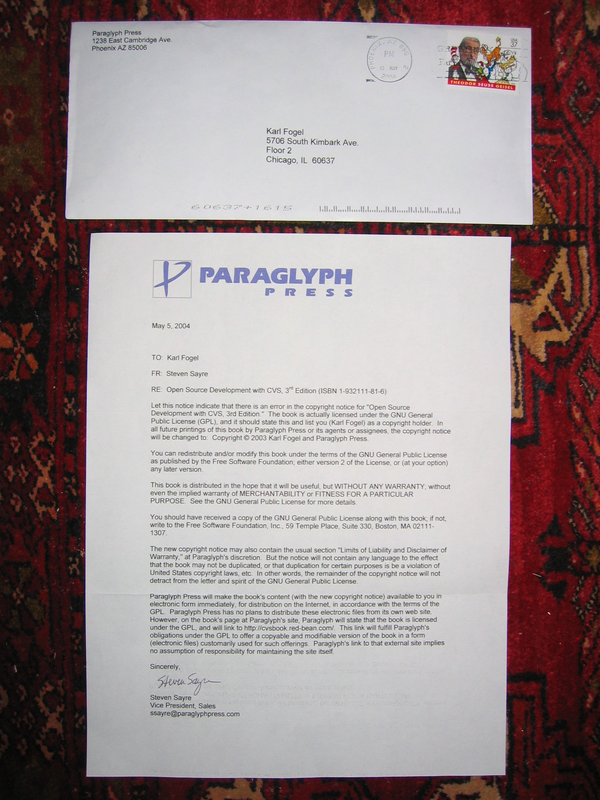 Paraglyph Press has acknowledged the misprint (see the letter they sent me), and promised to correct the mistake in any future printings. The misprint is that they claimed to be the sole copyright holder, and claimed that the book is distributed under standard "all rights reserved" terms. These errors were unintentional, and have been fixed in the PDF file that we distribute online. The above-mentioned letter confirms that I am a copyright holder and that the book is licensed under the GNU General Public License. If you would like to distribute, translate, modify, or use excerpts from the book, you are free to do so under the GNU GPL.